Occupational Community: Opportunity or Threat to Collective Action among Video Game Developers? This paper examines the propensity of video game developers to engage in collective action as a response to their employment risks. Mobilization theory (Tilly, 1978, Kelly, 1998) states that workers will move toward collective action if they perceive employment conditions as an ‘injustice’ and attribute that injustice to an external source (i.e., the employer or industry at large). 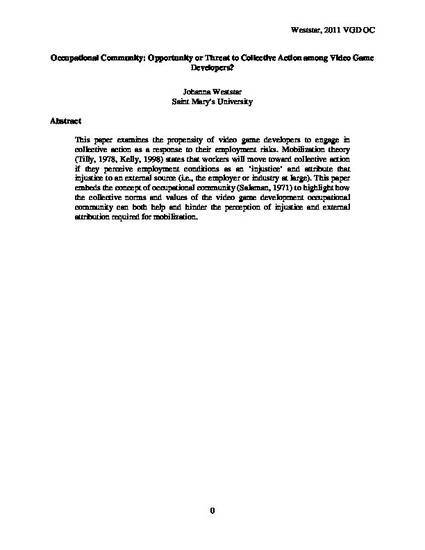 This paper embeds the concept of occupational community (Salaman, 1971) to highlight how the collective norms and values of the video game development occupational community can both help and hinder the perception of injustice and external attribution required for mobilization.